Happy Tuesday everyone! When I saw the theme for the SUO Challenge this time I COULD NOT WAIT to do it. If any of you have been following me for a while you know that I have a very favorite set in the whole wide world from SU and that is the Season of Friendship set (retired for several years now). When it was current I would use this set for everything. As far as I was concerned there wasn’t a sketch challenge or a color challenge I didn’t figure out a way to use it. So given the opportunity to pull this out and use it again MADE MY DAY! I update the look with new colors and new embellishments! Add some Night of Navy Enamel dot to tree to finish off. Happy Saturday everyone! A while back a did a cute butterfly card using this layout and thought I’d use the layout again for this card. 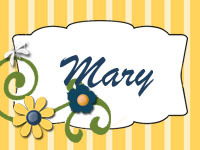 I also made a little favor for Create with Connie and Mary Card “Create”tions that matches this. You can see that HERE. The base of the card is Daffodil Delight. 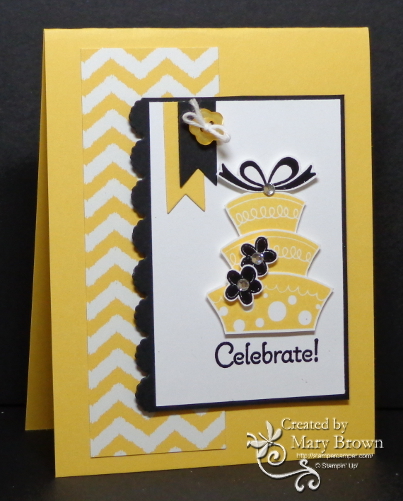 I took a piece of the chevron print from Parker’s Prints and added to the card base. Next I took a piece of Basic Black and used the Adorning Accents Edgelit on it. I embossed Celebrate using Black embossing powder, added banners (the large one from Bitty Banners) in both Daffodil Delight and Basic Black then added a Daffodil button using Whisper White Bakers Twine. I stamped the cake parts in Daffodil Delight, layered and added to the card front using dimensionals then stamped the bow and the flowers using Versamark and embossed with Black embossing powder, cut out and added to the cake. Finally I added some basic rhinestones to finish things off.